Some of Mada and Caroline’s closest friends and comrades subsequently died on active service. At the funeral of two of these Volunteers, Paddy Deery and Eddie McSheffrey, Caroline – standing in the front line defending our right to bury our comrades with dignity – had her arm broken by the RUC. CAROLINE MOORE grew up in a family of 12 – six boys and six girls – the youngest in the family. Tragically, Caroline’s mother also died very prematurely, when Caroline was only six years old. Her father was to die soon after. Maybe it was that experience that shaped Caroline’s outlook towards family and community. 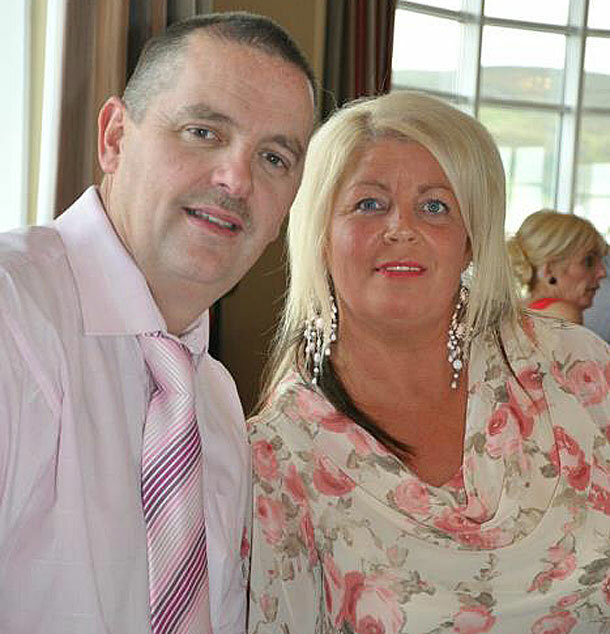 Her love and deep commitment to family was the essence of Caroline’s own family since meeting Mada almost 30 years ago, having been married together for almost 27 years and raising a family of four: Paul, Danielle, Shakira and Declan Óg. Caroline was also a republican in her own right and Mada was very much involved in the resistance. Caroline – as his partner and confidant – saw a hive of republican activity around the flat, with many IRA personnel coming and going and organising. Caroline was unwavering in her support of the struggle and resistance. She was arrested in the late 1980s and interrogated in Castlereagh as part of an RUC strategy to break republicans and their families. Mada was incarcerated in 1991 and sentenced to 20 years in prison. Like many other republican women, Caroline was left to raise (at this stage) three young children on her own, travelling up and down to prison, and holding down full time employment to ensure her children were looked after at home and that Mada was also looked after in prison. Throughout this time, Caroline also assisted the Sinn Féin project locally as an election worker. She was in protests against sectarian marches (being viciously dragged from the Derry Walls by the RUC), and campaigning for the release of all political prisoners. Caroline was always organising for her family and for her friends. If someone in the family needed something done they turned to Caroline; if close friends needed something they turned to Caroline. She was always the centre of craic and attention and banter. You’d often hear Caroline before you would see her. Caroline was as deeply loved and appreciated by her friends as she was by her family. None of us really knew or fully understood how big an impact Caroline’s health had on her life. That should not be surprising as she never complained, she rarely sat down and she always brought positivity, laughter and love into whatever company she found herself. To Caroline’s brothers and sisters John, Ray, Ambrose, Gerald, Paddy, James, Phyllis Ann, Vera, Cath, and Liz; to my good friend and comrade Mada; his children Paul, Danielle, Shakira and Decky; we extend our heartfelt condolences. Your loss is ours too.